It always brightens my day when I see (or hear) a Red-bellied Woodpecker! I’ve grown to expect them, especially in the wooded areas along our wetland paths. Never quite understood why they seem like such a special treat till I realized recently that they are much more prevalent here in Florida than they ever were in New York State, where I lived most of my life. And . . . they apparently like the same preserves that I frequent. 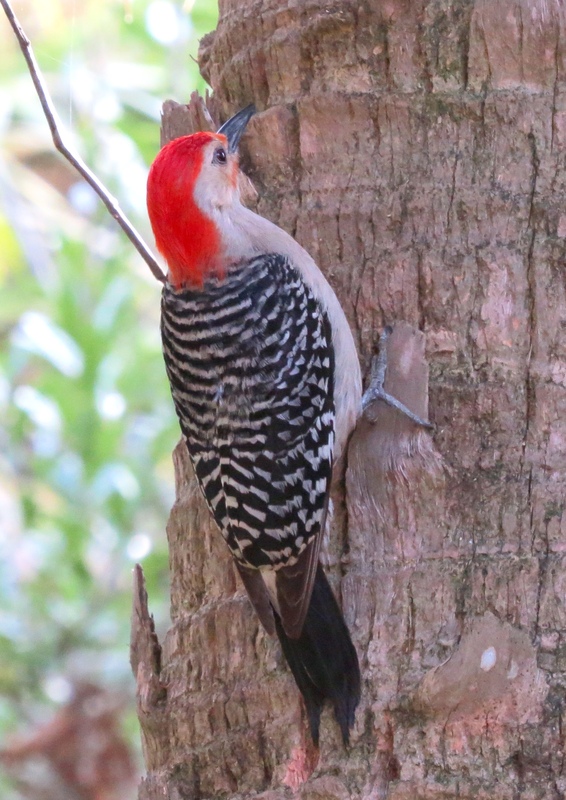 The Red-bellied Woodpecker climbs up, down, and around tree trunks and branches, feeding on insects, fruits, seeds, and sap that it finds in the nooks and crannies. Their brightly-colored heads and zebra-like stripes are very striking. The bright red top and nape can be deceiving . . . 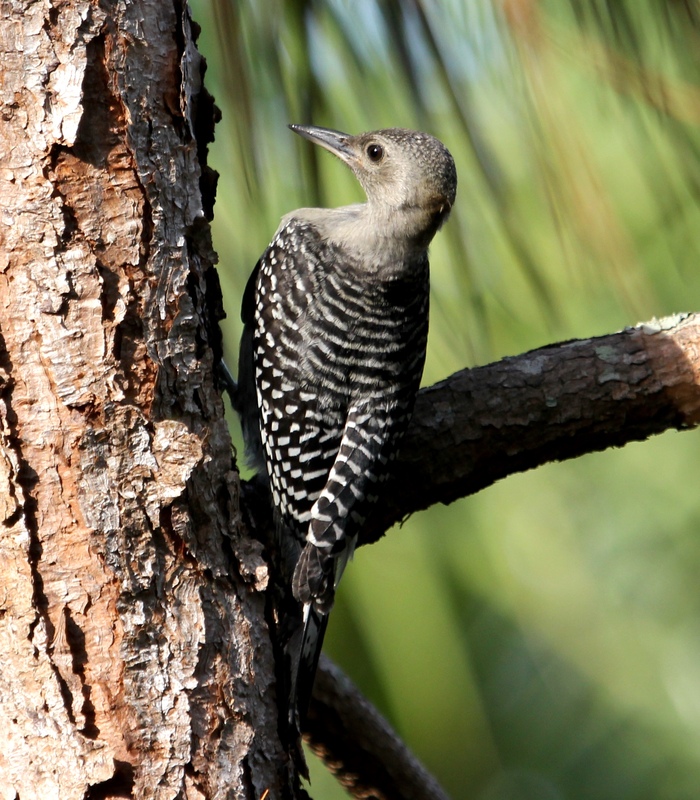 The Red-bellied Woodpecker is: “primarily a bird of the southeast, where its rolling calls are familiar sounds in swamps and riverside woods” (https://www.audubon.org/field-guide/bird/red-bellied-woodpecker). These photos of a male adult in one of his favorite trees were taken on a recent evening. He and his friends frequently entertain birders and photographers by stopping to pose at eye level, right in plain view. Though it’s often hard to see, the Red-bellied Woodpecker DOES actually have a pale reddish ‘wash’ on its lower abdomen. It’s easy to imagine why people sometimes mistake this bird for the more rare Red-headed Woodpecker. But once you see a Red-headed Woodpecker, you’ll realize how different they look. His entire head and neck are solid red, and his back, tail and wings are black with prominent white patches, as in the beautiful photo on this Audubon website link: https://www.audubon.org/field-guide/bird/red-headed-woodpecker. Another major difference is that the agile Red-headed Woodpecker catches insects in mid-air. When I came across this little fellow with the grayish-brown head this morning, I thought maybe I’d discovered a whole new species, since there was no sign of red! ;-D But then I came home and looked in my field guides, only to discover that the juvenile Red-bellied Woodpecker has a grayish-brown head – so it was undoubtedly just one of the local ‘kids’. 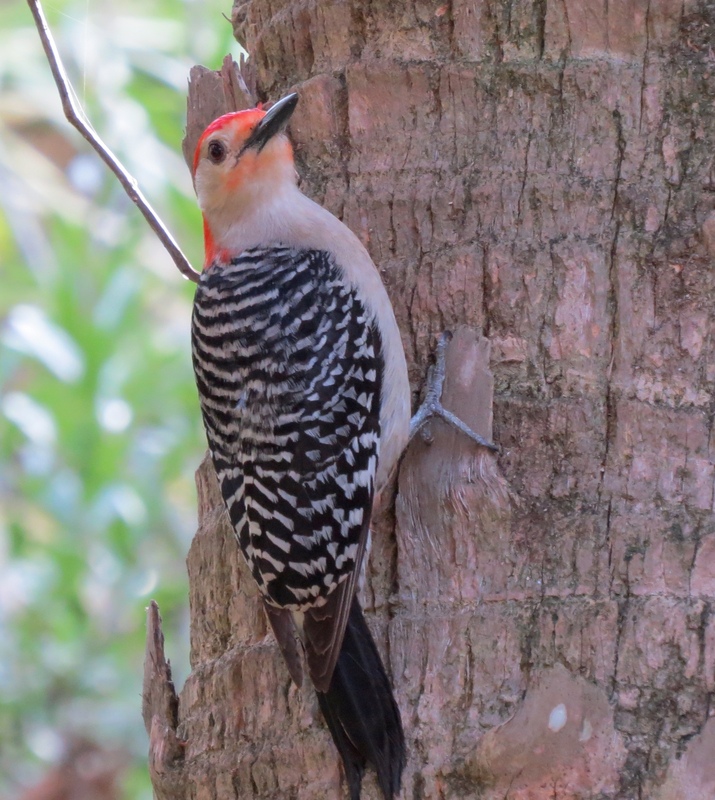 This entry was posted in Birds, Marsh/Wetlands and tagged Red-bellied Woodpecker. Bookmark the permalink. Yes very elegant. Great post. Thanks, Amy. They are such a joy to watch. So glad you enjoyed them, AB. Wishing you a lovely weekend! The photos are beautiful. I love this bird, also, and find them to be mesmerizing when they are around. I was so happy to see you posting on your blog again since your recent move, Lorri. You were missed! Thanks, jet! I must say that the photos look close because the tree and these Woodpeckers were really close – no more than a few feet away, at eye level. Outstanding photos of these beauties! We had some red bellied in our backyard but when the red headeds moved in the rb’s were chased off. Thanks so much. Wow, I’ve never had them in my right in my backyard! … but it’s still nice to know they’re in the preserves nearby. I love seeing these woodpeckers at our feeders. These are lovely shots of the Red-bellied Woodpecker. How nice it would be to have red bellied woodpeckers so close by that you could look at them from the window, and right in your yard! I feel lucky that they frequent these preserves that I visit so often. At my CT feeder, there’s a happy family this summer. Thx for the Juvie pic, I’ll never get that close. In my first FL winter, I was delighted to see these guys. How lucky for you to have one visit your feeder! Thanks for your visit, and glad you enjoyed the juvie. 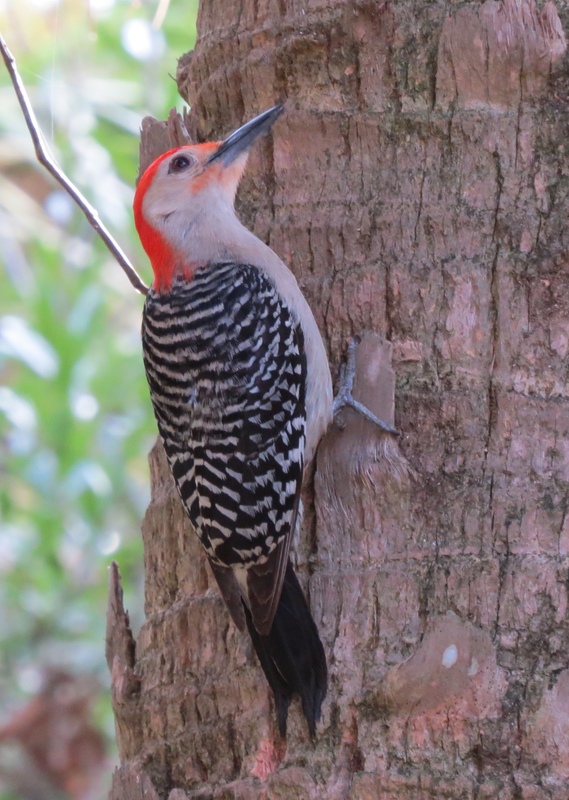 The Red-bellied Woodpeckers are beautiful! I see one or two in the salt marsh as well from time to time. We are lucky to have a few here almost all the time, though I’ve never seen a juvenile till now. That’s one colorful and prettily patterned bird. Like you, I don’t recall ever seeing one when I was growing up in New York. Always interesting to find out in life who also once lived in New York! That’s why I mentioned it. I grew up on Long Island and later lived for half a year in the Finger Lakes region.